Livid Instruments has made its name producing custom-built, mid- to high-end MIDI controllers, but the company now claims to be going 'back to basics' with its latest offering, the Alias 8. The Alias 8 is a simple, mixer-style controller featuring eight channel strips each with a fader, two rotaries and two buttons. There's also a master fader, encoder and small display screen. The whole thing comes in a compact aluminium casing that the company describes as both strong and light in weight. The Alias 8 has an RRP of $299 and is available to pre-order now. Check out the press release below for more info. Livid Instruments, maker of high-quality computer music controllers, today announced Alias 8, a "back to basics" controller designed to provide practical, extensible control for music software and plug-ins. "We've been making controllers and platforms that spark imaginations for many years now, and it's generated a lot of conversation with our users," says Peter Nyboer, Livid's software engineer. "With our XPC line of expansion controllers, we found that there were a lot of people looking for something simple and small to give them that extra little control to round out their studio. From that feedback, we designed the Alias 8." The Alias 8 control layout is immediately familiar as a small mixer with eight channel strips, anchored by 30mm faders well-suited for mute, solo, volume, and sends. 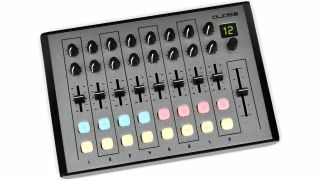 A full-sized fader for the master volume rounds out the controls. A detented encoder and small character display quietly offer a wealth of options for the Alias 8. The encoder can be used to immediately change the MIDI channel, instantly re-assigning all controls and extending the virtual possibilities. Press the encoder's button and it turns into a MIDI CC, perfect for controlling cue volume or flipping through a list of tracks. A quick look at the back panel reveals the USB jack for power and connectivity, and two of Livid's expansion ports for quickly adding controls with Livid XPC expansion controllers, or even a DIY project built from the user's imagination (and soldering iron). Small and portable, the Alias 8 is still quite sturdy, built from an all-aluminum body for strength and light weight. "I had an opportunity to design our smallest, thinnest controller, so I wanted to make sure the PCB and body could keep the excess to a minimum." explains Travis Redding, Livid's hardware design guru. "But I knew it still had to be comfortable to use and sturdier than the competition. I developed an all-new extruded aluminum body that is incredibly strong and compact. The final product is a controller that offers a ton of mixing capability with a footprint smaller than a sheet of paper and a metal body skinnier than an inch." Perfect for basic mixing tasks, tweaking your favorite plug-ins, or wrangling your return channels, the Alias 8 frees up your more sophisticated instruments for their full creative potential, and adds those extras knobs and faders you always seem to need. For people just getting their hands wet in computer music, the Alias 8 gives them a low-cost, well-made controller that gets them started with the basics of production, and gives them freedom to grow and explore without needing a ton of extra gear. With a fixed MIDI mapping and only a few simple configurations made by sending CC messages to the Alias 8, the controller can be quickly mapped with the "MIDI learn" features found in almost any software. The Alias 8 is handcrafted with only the highest quality parts and components at Livid's own manufacturing shop in Austin, TX. Alias 8 can be ordered directly from Livid Instruments online shop and shipped worldwide, or ordered from one of the dealers in our global network. Information taken from official press release, for more visit Livid Instruments.